At Markeya Lowery’s last case management job, she filled a similar role to the one she has now — helping people address all the distractions and hardships that make going to school and holding down a steady job really difficult. But her position at Community Kitchen Pittsburgh, she said, is much more delicious. The daily menu at the facility in Hazelwood sometimes sounds like what you might expect from a fine dining experience — peach-braised chicken, Vietnamese summer rolls, garlic-charred Brussels sprouts — but most of its dishes aren’t for sale. 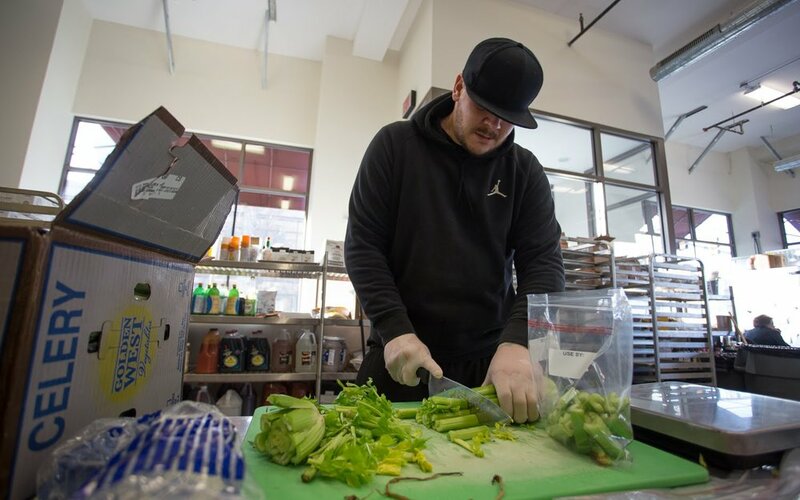 Adult students in their culinary training program turn bought products and fresh produce salvaged by other hunger relief organizations into about 2,000 meals a day for local schools, shelters and treatment centers at no cost to the hungry. While learning about knife skills and emulsion blenders, participants also work with Lowery and career services coordinator Robert Massey, who try to steel them for their next job. “Some of them carry heavy baggage, some of them come just from prison, some of them have never worked a day in their life, and some of them, they're not [used to] structure,” Massey said. The kitchen is something of a middle ground in Pittsburgh’s anti-hunger community, in that it both serves and receives donated food. And it can thrive this way, advocates said, because for almost 40 years the city has been on the forefront of addressing food insecurity.